Up and down the ballot, Tea Party conservatives in the Lone Star State had a strong showing in Tuesday’s Republican Primary and U.S. Sen. Ted Cruz proved that his support means life or death in the GOP. Not a single Tea Party-favored incumbent being challenged by the Republican establishment lost in Tuesday’s election. Meanwhile, one liberal Republican senator and three incumbent House members fell to tea party-backed challenges. The attempt by trial lawyers to play in the GOP primary and take out three conservative Supreme Court justices failed miserably. Perhaps no one had a better night in Texas than Cruz, who had endorsed the three justices. Similarly, his endorsement of Fort Worth Tea Party activist-turned-senatorial candidate Konni Burton helped propel her into a run-off election. Even his supportive words seemed to have a big effect. In statewide races, Ken Paxton and Wayne Christian — running for Attorney General and Railroad Commissioner, respectively — made extensive use of Cruz’s name, comments of support, and friendship. The same went for Cruz’s support in two big state senate races. Incumbent State Sen. Donna Campbell of New Braunfels beat back challenges from two establishment-backed challengers. In Dallas, Don Huffines defeated a long-serving state senator who had been named the most liberal member of the GOP caucus in the chamber. National media outlets have been stumbling over themselves in misreporting Texas’ Republican election results. Both publications wrongly hang their narrative on Sen. John Cornyn’s easy re-election victory, inexplicably painting challenger Steve Stockman as a “Tea Party” candidate despite the fact Tea Party leaders from around the state denounced his candidacy. The national media is conveniently ignoring every other race on the ballot — most of which attracted more attention in-state than Cornyn’s bid. More Republicans voted in the gubernatorial (1.33 million votes cast) and lieutenant governor (1.32 million) races than in the senatorial contest (1.31 million). Incumbent Lt. Gov. David Dewhurst, who has held statewide office since 1998, ended Tuesday night’s primary with 72.6 percent of GOP voters casting ballots against him. Leading the Lt. Governor’s race with 43 percent of the vote was conservative State Sen. Dan Patrick of Houston, generally perceived as the most vocal Tea Party candidate on the statewide ballot. In every statewide race heading to a run-off, the conservative candidate closest to Tea Party and grassroots activists leads the field. For example, Paxton commands an 11-point lead going into a run-off for Attorney General with State Rep. Dan Branch. Paxton, a Tea Party favorite, was out-spent by the liberal-leaning Branch who drew dollars from the Bush-Rove political machine. Conservative challengers claimed three House seats from establishment incumbents with close ties to liberal-leaning House Speaker Joe Straus. Establishment forces were only able to manage challenges to three Tea Party incumbents: Charles Perry of Lubbock, Jonathan Stickland of Bedford and Matt Schaefer of Tyler. All three of them won solidly. 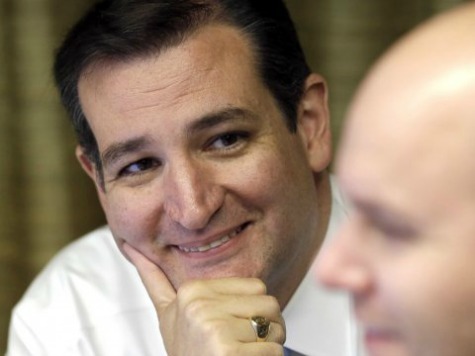 They each enjoyed explicit support from Cruz.